January is the month for new year’s resolutions and fresh starts. After the debauchery of the holidays, nothing signifies turning over a new leaf better than opting to let go of rich, calorific food in favor of smarter food choices. For me, that includes cutting down on soda in favor of fruit juices. And thanks to some samples I received from Tropicana, I was able to try fruit juices that offered more than the standard flavors, without having to troop to a specialty juice bar. Tropicana Twister’s limited edition flavors aren’t your usual single flavor drinks. Instead, they feature interesting fruit combinations making for intriguing new flavors you can’t get anywhere else. These variants are available in two flavors: Apple Lemon and Red Fusion. 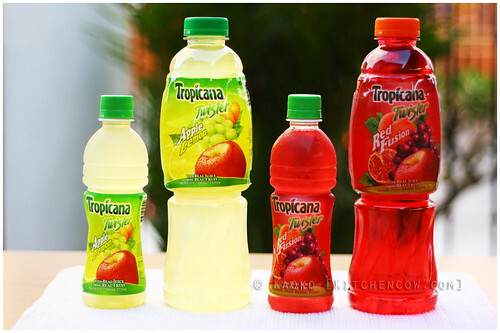 These fruit combinations are made with real juice from real fruit, like most Tropicana drinks. Apple Lemon combines apple, white grape, peach, pear, kumquat and lemon juices, making for a refreshing drink that reminds one of lemonade laced with other fruits. It has a light tang from the lemon and a touch of sweetness from the apple and grape. Because of its lemon base, this variant can easily be one of my ready-to-drink juice favorites. 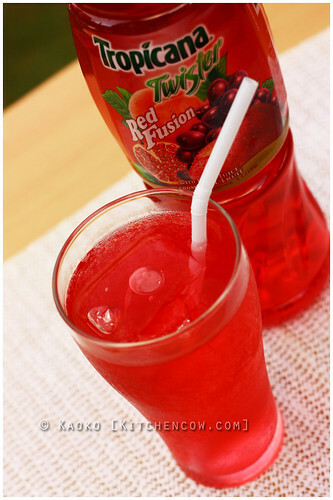 The Red Fusion, on the other hand, is a sweeter affair, blending apple, pomegranate, red grape, purple sweet potato and peach juices. This has a younger, more festive feel, reminding me of bright red apples, plump grapes and a cheerful candy sweetness that kids will surely go nuts for. These juices are sold in 355ml single serve bottles and in 1L bottles that’s perfect for family or barkada sharing. As with most limited edition drinks, these are only available for a limited time so if you’d like to try it, be sure to check out your nearest supermarket. Do it soon. Who knows, you might find the need to stock up on it after you try it. Disclosure: This is a sponsored post paid for by the advertiser. Nevertheless, the content of this post is truthful and reflects the actual opinions of the writer. This entry was posted in food spotlight, sponsored events and features. Bookmark the permalink.